“Tree of Life” Persian Sultanabad carpet in Big Sky Living Room. A one-in-the-world Tree of Life oversize Sultanabad in the main seating area of a grandly proportioned Big Sky living room. 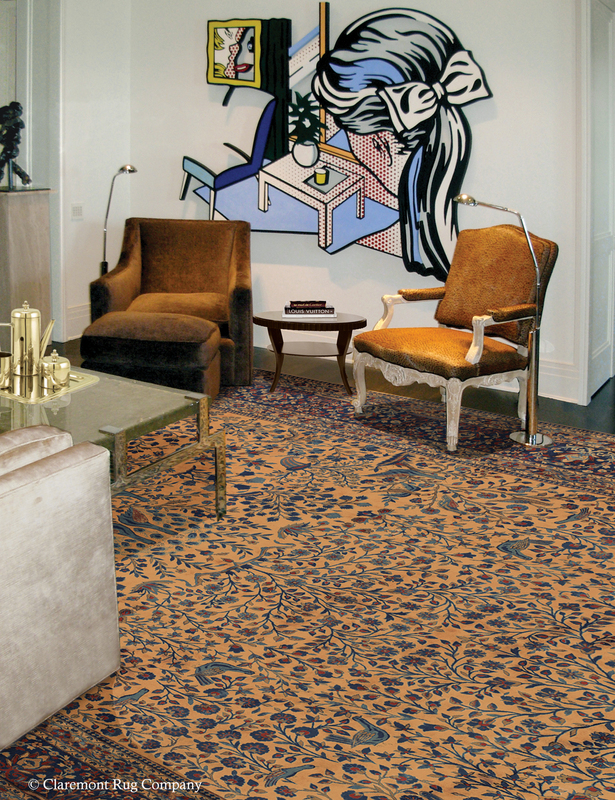 Palace Size Persian Manchester Kashan with Lichtenstein painting on the wall make a memorable pairing. From the opulence of aged Persian beauties, to the rustic simplicity of hooked rugs crafted during the 19th century, brilliantly woven textiles have long been a source of inspiration for designers and a coveted prize for collectors. Ranging from the delicately complaisant to the intrepidly bold, these artisan works don’t merely lend form to function; they catapult a room’s level of distinction into another stratosphere of style – starting from the ground up. Long before the first artisan knotted a single thread of silk or wool; animal skins served as early versions of what we refer to as rugs today. One can only assume that our prehistoric predecessors lined their dens without much care given to scale or placement. Yet, even those most primitive of floor coverings played a hugely defining role. Significant as lauded trophies no doubt immortalizing the hunters who acquired them, the pieces also served a blatantly utilitarian purpose in bringing physical warmth to the homes of cave dwellers. Antique Persian Hadji Jallili Tabriz, 4’1″ x 5’7″ — 3rd quarter, 19th century. 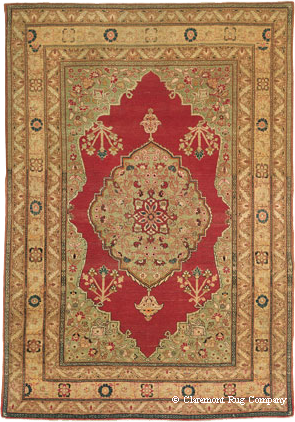 A masterwork of color and consummate craftsmanship from the elite Hadji Jallili (Haji Jalili) Tabriz workshop, this collector-caliber rug displays a stunning naturally dyed palette of rare apple, celadon and olive greens as well as an expertly striated carnelian tone in the minimalist field. Fast-forward to the birth of modern civilization when walls replaced caves and the human desire to more consciously adorn one’s shelter began to grow deeper and we find remnants of the glorious textiles once used underfoot. Beautiful relics telling the story of a family’s success as readily as those prehistoric hides told the story of a hunters prowess, these textiles have been found secreted away along with artifacts that together comprise a vivid image of daily, period life. Dating back to the centuries before Christ, these hand-knotted rugs were used to record the history of a culture, to warm and beautify a space while illustrating the life that existed within it, to document and record a history through color and pattern. It was here that the concept of the ornate, modern rug was born. A concept destined to become inextricably interwoven – so to speak – with modern design and lifestyle. 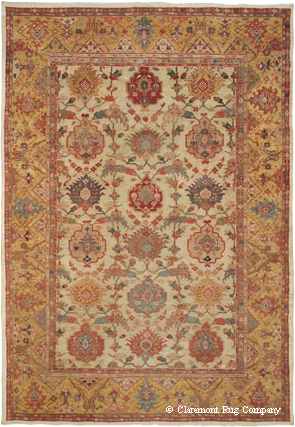 Antique Persian Ferahan, 4’2″ x 6’6″ — early 19th century. This 200-year-old virtuoso piece demonstrates the artistic power of the best Persian rugs from the early 19th century, long before the advent of the commercial compromised the artistic grandeur of Persian rugs at the turn of the 20th century. It presents a central sunburst, the creative force in nature, giving life to flowers of various sizes. It presents spectacular dye work, including astonishing greens and potent corals. 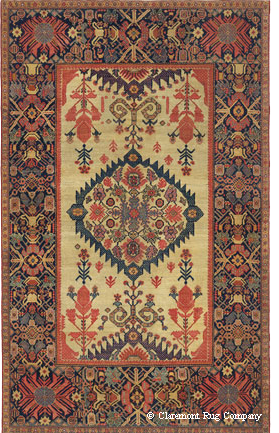 Antique Persian Sultanabad, 11’11” x 17’5″ — circa 1875. Because of its uncommonly spacious design of over scale motifs, prized ivory field and exotic color palette, this extraordinary Persian village carpet was likely a commissioned piece. Its elegant stylized palmettes evoke a quintessential beauty that was unique to Persian rug weaving through the ages. While there still exists craftsmen creating contemporary interpretations of these textiles – often using the same techniques and materials that have been hallmarks of the art for millennia – the patina of age has its own, unmistakable charm. Charm that commands a staggering price – as was the case with a masterpiece believed to have been woven during the first half of the 17th century and which sold for a record-breaking $33.8M US – purportedly to a Dubai museum eager to welcome the revered piece back to its homeland. With such unfaltering appeal, the real challenge in selecting woven art to lie underfoot may be in identifying the differences between rugs that are simply beautiful and those that surpass sheer aesthetics to cross into the realm of investment-worthy art acquisitions. Collectible Caucasian rugs on wall in cutting edge island home. 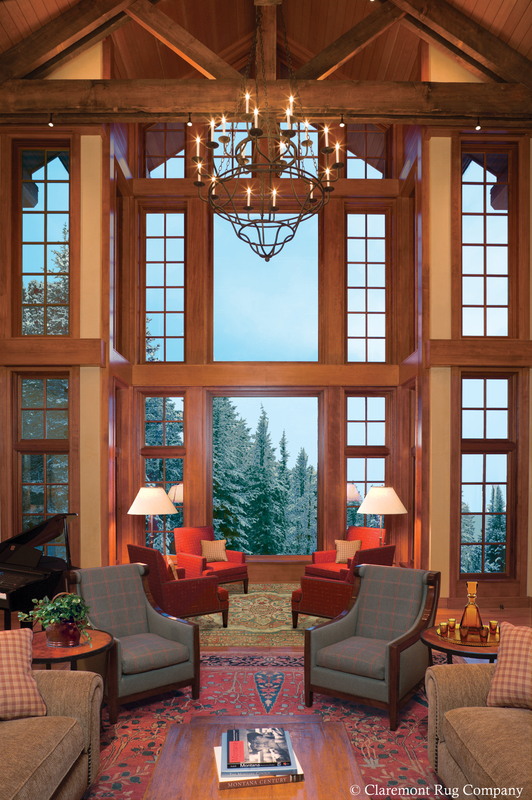 The vaulted, light infused island architecture enhances the aged patina of the two collectible Caucasian tribal rugs. Helping to navigate clients through the process of building their collection; dealers like the Claremont Rug Company offer the same expertise, guidance and services one would expect from any formidable, trustworthy art gallery.  “We are assisting those clients wanting to acquire antique Persian and tribal rugs intended to be part of their art collections,” says long time collector, preeminent expert and company president, Jan David Winitz. Winitz’s account of how some of these woven marvels came to be is as provoking at the art itself. In a fascinating history lesson, Winitz explains how in order to maintain unity in a single work despite being crafted by many, the weavers would often chant. The melodic sound a human metronome that created the score by which the artists wove a culture, as well as a textile. Such a beautiful story it is.